Steak and kidney pudding is a dish made by enclosing diced steak and beef, lamb's or pig's kidney pieces in gravy in a suet pastry. 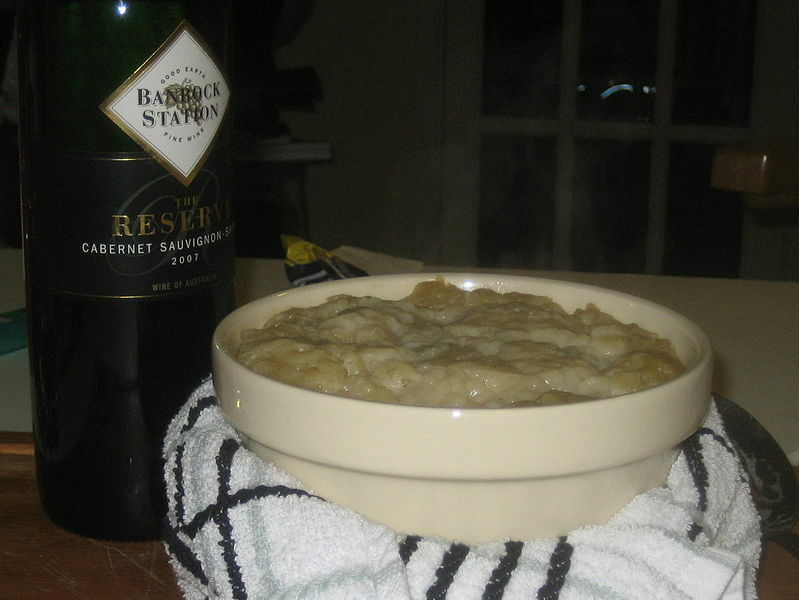 In some areas, a "Steak pudding" is served instead, omitting the kidney from the ingredients. Left: Steak and kidney pudding. The pudding is then steamed for many hours until cooked. In making a pie, the steak and kidney is usually pre-cooked with chopped onions etc by simmering for a few hours, before placing it in a pie and baking in the oven. With Steak and Kidney pudding, the suet pastry is used to line a bowl into which the uncooked steak and kidney mix is placed with onions, stock etc. A suet pastry lid is then placed on top and sealed tightly. The top is then covered with muslin cloth which is tied round the bowl. This is placed in a covered saucepan and steamed for about four hours or until the pudding is cooked. Some recipes then stipulate making a small opening in the top and pouring rich stock into the pudding ten minutes before serving. Steak and Kidney pudding is a popular dish in the British Isles and regularly offered on the menu of pubs and restaurants.